If you’re a regular reader of my blog you probably remember that Nick and I visited Disneyland Paris at the end of January for our 8 year anniversary. It turned into a very special trip as Nick proposed! You can read more about that here if you’re interested. We had such a fun time while we were there that we’ve decided to go back and I genuinely can’t wait! I’m counting down the days, one month to go! I’ve been watching tonnes of videos and doing a fair bit of research to find any hidden secrets or things we might have missed in January. 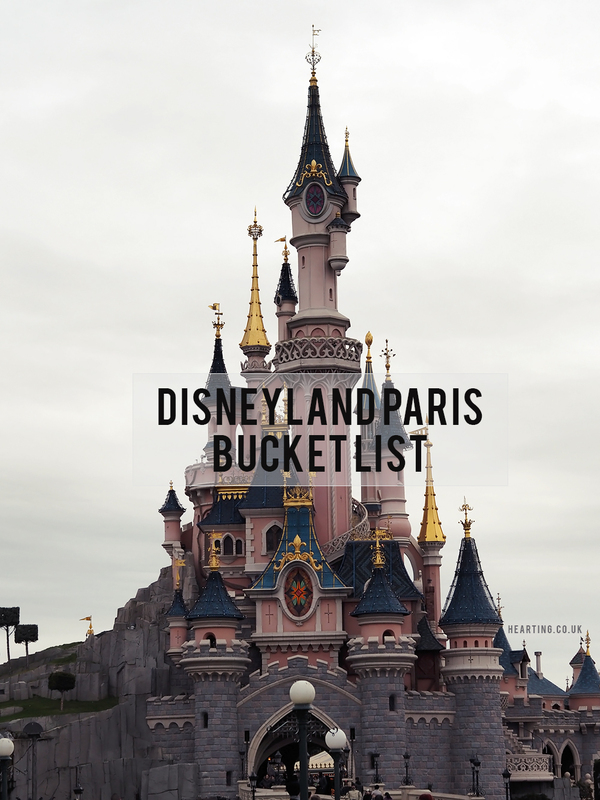 So aside from going on all of our favourite rides, here’s my bucket list of everything I’d like to do while in Disneyland Paris. Experience the magic | the detail, the music, the atmosphere, the buzz, Disneyland Paris truly captures the essence of magic and I can’t wait to experience it all over again. I’m sure I’ll notice loads of things that I didn’t in January. Watch the extended spooky show | we’re visiting Disneyland Paris quite close to Halloween so I’m looking forward to catching the Halloween Festival Parade and more importantly the spooky show at the Royal Castle Stage. Eat hakuna fries at the Hakuna Matata restaurant | hakuna fries are unique to Disneyland and I’ve read that they’re delicious. Drink a Glowtini cocktail or two | I’ve seen pictures of these and they look amazing! Blue Lagoon cocktail with a souvenir lit ice cube (sometimes it’s even a Tinkerbell!). Pick up a Christmas decoration | seeing as Disneyland Paris holds so many beautiful memories for us I think we need to pick up a few decorations for our tree. Experience the Mickey and the Magician show | shown in the Animagique Theater of the Walt Disney Studios Park is the Mickey and the Magician illusionist show. I’ve heard some great things. Capture lots of photos | I did take quite a few photos when we visited in January but I definitely want to make sure to capture every experience of this holiday too. I especially want to make sure that there are plenty of photos of us. Try Mickey waffles | Mickey shaped waffles? How could I ever say no to that! Watch the Night Time Spectacular show at least one | I’m such a massive fan of fireworks and I love the Night Time Spectacular show so we have to make sure to see it at least once. Dine at Auberge de Cendrillon | this restaurant looks absolutely stunning, and although it will probably be our most expensive meal while staying in Disneyland Paris it will be pretty awesome to have a meal surrounded by princes and princesses. Do you have any Disneyland Paris recommendations? I’d love to hear any tips or suggestions!